JCB Power Products is extending its flagship QS generator range powered by Stage IIIA JCB six-cylinder engines. The G166QS, G201QS and G221QS add an emission compliant engine option to the previous G165QS, G200QS and G220GS respectively. They offer outputs of 150kVA, 180kVA and 200kVA. The addition of these three premium models takes JCB’s standard Stage IIIA powered generator range from 20kVA right through to 550kVA. Customers will be able to order and purchase this full line of highly efficient Stage IIIA generators until the end of 2020, when Stage V emissions standards will be adopted. For the customers who require lower emissions, but still require maximum fuel efficiency and reliability, JCB Stage IIIA generators provide the ideal power solution to meet the strict environmental needs. 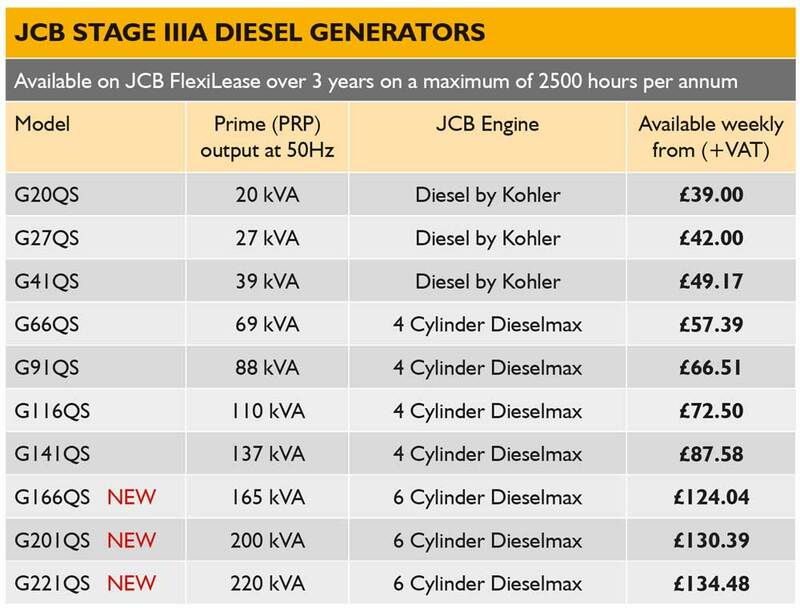 With the launch of JCB Flexilease, these efficient generators are available from an affordable £39 +VAT per week. This is based on a 3 + 33 month lease agreement on a max of 2500 hours p/a. For a limited number of machines only on orders placed before 31st October 2018 via Greenshields JCB. JCB Generators from £39 per week. In addition to Hire Purchase and Finance Lease options, customers now have the option to use JCB FlexiLease as a way of acquiring the QS Stage IIIA generators. JCB FlexiLease provides customers with a fantastic opportunity to acquire the use of a generator with a lower initial outlay, instead of purchasing the generator outright or through a typical Hire Purchase agreement. Another advantage of Flexilease means the VAT is payable as the payments fall due and not all up front, making it an attractive way of acquiring a generator for your business if ultimate ownership isn’t required. Payments on a JCB Flexilease are lower in comparison to a standard lease or hire agreement because there is an ‘Investment Value’ stood by JCB finance Ltd that remains unpaid by you and the unique aspect to JCB Flexilease is that it offers you the chance to earn from the disposal of the generator at the end of the agreement. Acting as an agent you can find a buyer for the generator (giving the original supplying dealer the first option) and anything achieved above the Investment Value is yours. This presents a possible cash back opportunity or a payment towards a new generator. Alternatively you can return the generator to JCB Finance Ltd – return conditions apply. All QS generators are supplied with JCB’s LiveLink for Power telematics system, as standard above 60kVA. This recently updated system allows fleet managers and owners to monitor equipment in real-time, preventing low fuel problems and ensuring that all maintenance work is carried out at the recommended intervals. The new system provides additional fuel data, including secondary tank levels. Customers can also use LiveLink to calculate CO2 and CO2E, to provide carbon accounting data to clients. LiveLink for Power also delivers smart notifications, including inactive generator warnings, rough handling alarms and notifications of low load, no load and low power factor operation. Contact us for more information. 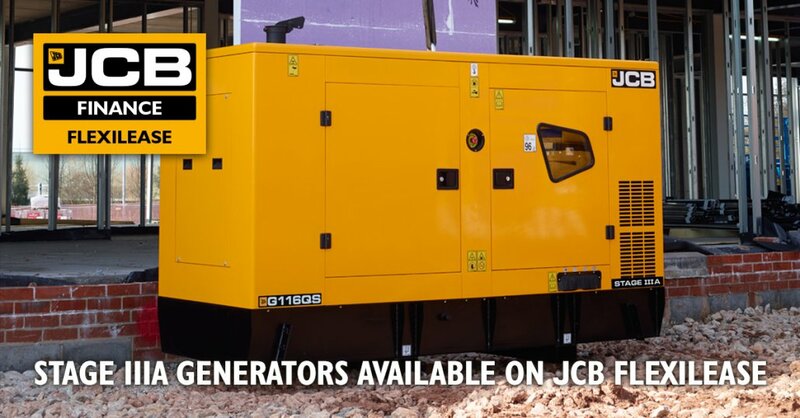 JCB Generators from £39 per week.